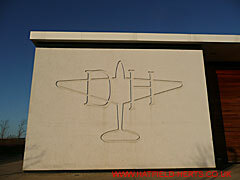 Hatfield has been home to the de Havilland Aircraft Company (DHAC), Hawker Siddeley and British Aerospace. And also for Airspeed Ltd. However, it played a part in the story of many other companies, institutions and air forces. Below are just a few of them (in alphabetical order). Formed by ex-DHAC employees and later to be absorbed back into the DHAC. It went through many phases – Airspeed Limited (1931), Airspeed (1934) Limited, Airspeed Limited, Airspeed Division of de Havilland and de Havilland Aircraft Company, Christchurch – in its brief but remarkable history. People and planes from Hatfield went to Airspeed and people and planes from Airspeed came to Hatfield interweaving the two in the history of British aviation. The German air force was responsible for all the civilian deaths in Hatfield during WWII. However, the Luftwaffe first called on Hatfield long before the start of the war. The Royal Air Force Museum wings at Hendon and Cosford both contain a number of aircraft linked to aviation in Hatfield – some of them were built here.